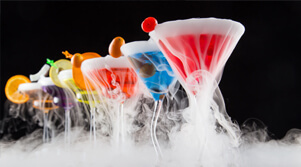 Dry Ice supply have been working with Chefs all over the United kingdom and Europe to help them produce some truly mesmerising dishes and drink effects. Our dry ice is approved for food grade and can be delivered to you by purchasing online (Tues-Fri) SHOP NOW or CALL US to arrange same day delivery or bespoke requirements. 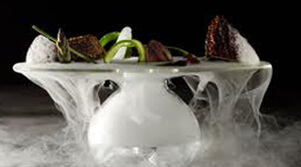 Dry ice is a great way of both conveying aromas as well as adding to the spectacle of a dish. 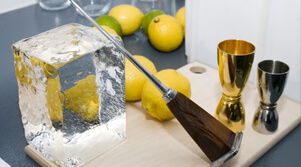 We have used this as a method of heightening the aroma sensation with several dishes, examples of which include the aroma of the sea served with a marinated crayfish, seaweed and green bean dish and a matcha tea aroma ‘cloud’ which served with a sake, aloe vera and tapioca cocktail (created by Chef Helder Gila Alonso). So here you have inspiring, practical ways of enhancing the scent element of dishes. Do try them out – not only will the food taste better but your guests will definitely get a kick out of the interactivity of atomisers or spectacle of dry ice smoke clouds!